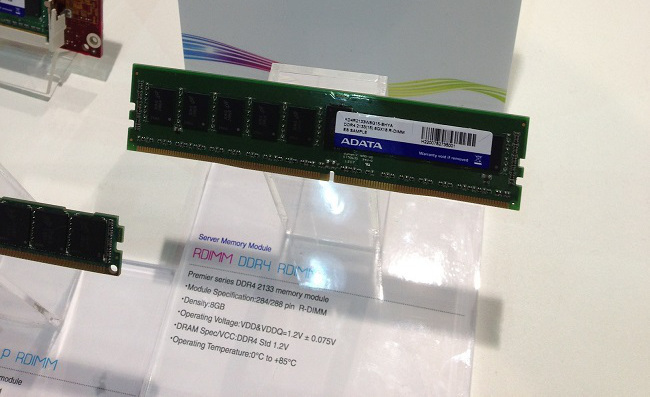 Taipei, Taiwan – April 2014 – ADATA™ Technology, a leading manufacturer of high-performance DRAM modules and NAND Flash application products, has announced the launch of new DDR4 modules. Working in close cooperation with Intel®, ADATA has successfully developed and launched DDR4 RDIMM (ECC Registered DIMM) that are fully compatible with the newly announced, next generation platform of Intel® Xeon™ processor E5-2600 v3 product family. Coming in densities of 4, 8 & 16 gigabytes, the new modules run at 1.2 volts, and at a frequency of 2133MHz. The higher clock frequencies, faster data transfer rates, and low voltage operation of DDR4 memory make it especially suited for use in the growing cloud server, storage and networking application fields.